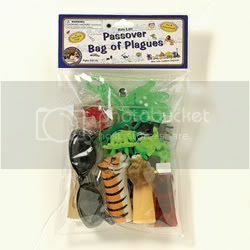 Clever, Crafty, Cookin' Mama: Bag O' Plagues?!? So I was wandering through Party City today on a reconnaissance mission to scout out Elmo options for my daughter's upcoming 2nd birthday in May, when I happened across one of the oddest things I've seen in a long time. I literally stopped dead in my tracks... dead being the operative word here. My personal favorites? The sticky hands with white boils (cause, you know you want your kids playing with boils), the vial of "blood" (love the disclaimer cause real blood might be straw that crosses this camel into "creepy" land), and of course the giant scary louse. The sunglasses (for the darkness plague) add a nice touch and can be used later for "Risky Business" floor slides and Secret Service make-believe games. I was so enamored with this little bag of God's wrath that I HAD to share it with my zany friends, so I clicked a quick cell pic of the bag with matching title and sent it off with the caption.. What the?!? A few moments pass and I get an overwhelming response. Where ARE you?? Another wrote, "that's hilarious, but where the hell are you?" I replied... I'm at the passover section of Party City... talk about a fun theme party, my friend. It's not a party til someone cracks open the bag of plagues. Let the death and mayhem begin. I'd like to state for the record here that I'm not at all dissing the Jewish faith. I was just surprised to find such a wonderful little abstract item tucked between the Mardi Gras and St. Patrick's Day party supplies. The more I think about it the more I want to go back and get myself a bag O' plagues. Hey I think the Jews are on to something. Heck more power to them. Especially this time for thinking outside the pox. Bag 'O Plagues has been a family tradition for us over 3 decades. My life has changed due to "Bag O'Plagues"
OMG! I can see that the Bag O’ Plagues is the must –have party item of 2008!!! I want one, one bag of plauges for me please!